The All-NBA Team is an annual National Basketball Association (NBA) honor bestowed on the best players in the league following every NBA season. The voting is conducted by a panel of sportswriters and broadcasters throughout the United States and Canada. The team has been selected in every season of the league's existence, dating back to its inaugural season in 1946. The All-NBA Team originally had two teams, but since 1988 it is typically composed of three five-man lineups—a first, second, and third team. Players receive five points for a first team vote, three points for a second team vote, and one point for a third team vote. The five players with the highest point totals make the first team, with the next five making the second team and so forth. In the case of a tie at the fifth position of any team, the roster is expanded. If the first team consists of six players due to a tie, the second team will still consist of five players with the potential for more expansion in the event of additional ties. A tie has occurred only once, in 1952, when Bob Davies and Dolph Schayes tied in votes received. 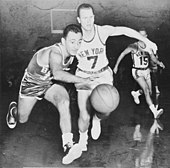 From 1946 to 1955, players were selected without regard to position; however, since 1956, each team has consisted of two guards, two forwards, and one center. 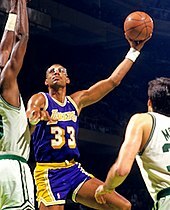 Kareem Abdul-Jabbar, Kobe Bryant and Tim Duncan hold the record for the most total selections with fifteen. Karl Malone, Shaquille O'Neal, and LeBron James follow with fourteen total honors, while Schayes, Bob Cousy, Jerry West, Hakeem Olajuwon, Dirk Nowitzki have twelve selections. James has the most All-NBA first team honors with twelve, while Malone and Bryant are tied for second-most with eleven. Bob Cousy has been selected to the All-NBA team 12 times. From the 1946���47 season to 1954–55 season, the All-NBA Team was composed of two teams, each with five roster spots, except when there were ties. During this period, players were selected without regard to position. Bill Russell (left) has been selected to the All-NBA team 11 times. 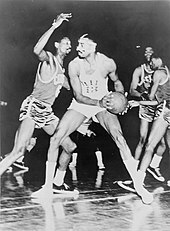 Wilt Chamberlain (center) has been selected to the All-NBA team 10 times. Kareem Abdul-Jabbar, also known as Lew Alcindor, has been selected to the All-NBA team a record of 15 times. 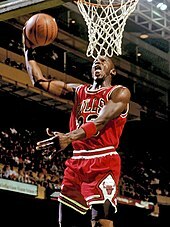 Michael Jordan has been selected to the All-NBA team 11 times. 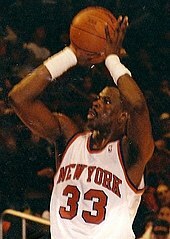 Patrick Ewing has been selected to the All-NBA team 7 times. Kobe Bryant has been selected to the All-NBA team 15 times. From the 1955–56 season to 1987–88 season, the All-NBA Team was composed of two teams, each with five roster spots, except when there were ties. During this time, players were selected with regard to position; they are listed according to position in the following descending order: two forwards, one center and two guards. Since the 1988–89 season, the All-NBA Team has been composed of three teams, each with five roster spots, except when there are ties. Players are selected with regard to position; they are listed according to position in the following descending order: two forwards, one center and two guards. The following table only lists players with at least ten total selections. a The Most Valuable Player award was first established in 1956.
b Before the 1971–72 season, Lew Alcindor changed his name to Kareem Abdul-Jabbar. c When Olajuwon arrived in the United States, the University of Houston incorrectly spelled his first name "Akeem". He used that spelling until March 9, 1991, when he announced that he would add an H.
d Ron Artest changed his name into Metta World Peace on September 16, 2011.
e Amar'e Stoudemire's first name had previously been spelled incorrectly as "Amaré" or "Amare" since joining the NBA, but was changed to "Amar'e" in October 2008. "All-NBA Teams". NBA.com. Turner Sports Interactive, Inc. Archived from the original on September 17, 2008. Retrieved August 7, 2008. "All-NBA and All-ABA Teams". basketball-reference.com. Archived from the original on July 30, 2008. Retrieved August 7, 2008. 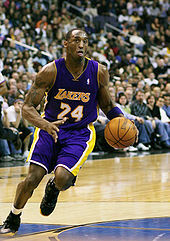 ^ a b "MVP Nash Highlights All-NBA First Team". NBA.com. Turner Sports Interactive, Inc. May 17, 2006. Archived from the original on February 28, 2007. Retrieved January 18, 2007. ^ a b "All-NBA Teams". NBA.com. Turner Sports Interactive, Inc. Archived from the original on September 17, 2008. Retrieved August 7, 2008. ^ a b c d "All-League Selections by Player". basketball-reference.com. Archived from the original on June 30, 2008. Retrieved August 7, 2008. ^ "Kareem Abdul-Jabbar Bio". NBA.com. Turner Sports Interactive, Inc. Archived from the original on July 31, 2008. Retrieved August 4, 2008. ^ "Hakeem Olajuwon Bio: 1992-93". NBA.com. Turner Sports Interactive, Inc. Archived from the original on May 16, 2008. Retrieved June 15, 2008. ^ Dufresne, Chris (March 11, 1991). "Hakeem Still Can Be Called 'the Dream'". Los Angeles Times. p. 2. ^ "Artest's Name Change to Metta World Peace Approved". The New York Times. September 16, 2011. Retrieved September 16, 2011. ^ Bickley, Dan (October 30, 2008). "Bickley on Amaré: Awaking the giant". The Arizona Republic. Retrieved March 25, 2009. ^ McMenamin, Dave (November 20, 2008). "Change the name of the game for Stoudemire this season". NBA.com. Turner Sports Interactive, Inc. Archived from the original on February 27, 2009. Retrieved March 25, 2009.